Album artwork by Glenn Arthur, source: Delain. Death will come for me, but not tonight. 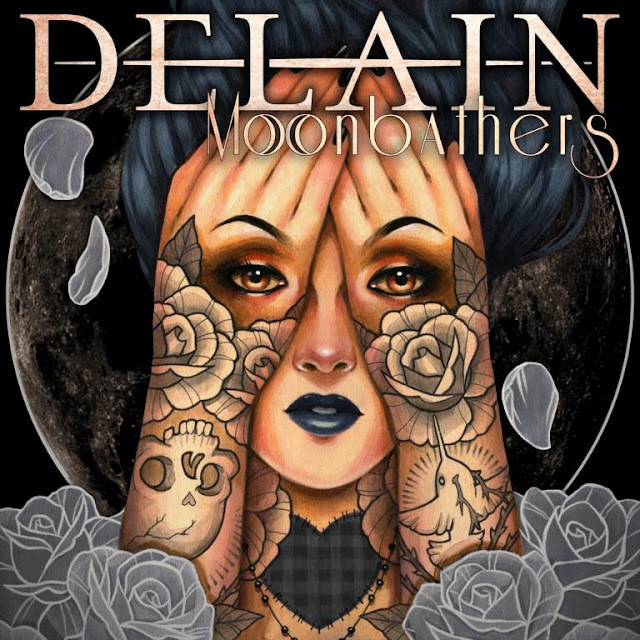 After prepping us up with a Lunar Prelude, it is time for Delain to release their fifth studio album in a decade: Moonbathers. And it is everything we expected. By "we" I mean long-term fans, of course; new introductions to their sound sometimes find them either 'too metal' or 'too pop' to like straight away, but that is precisely where the peculiarity of Delain's music lies - in their distinctive mix of pop, rock, and symphonic metal. Each of their albums has some sort of theme running through it and none of them are quite alike. In Moonbathers, they've opted for a production similar to that of their last album (read more here), yet, musically, it comes closer to their April Rain days. There is also something reminiscent of Nightwish in the sound, though one might struggle to put one's finger on precisely what it is. Either way, one thing you will notice Moonbathers is that nothing sounds 'forced' - neither too hard nor too soft, but a comfortable balance of heavy riffs and ethereal orchestration. To add to this, their vocalist Charlotte Wessels keeps improving with each consecutive album, reaching a new height in this one. One thing is for certain: you are in for something much more varied than you're used to. Lyric-wise, Moonbathers is, again, more like The Human Contradiction - the band have long abandoned the elements of fantasy in Lucidity, and they now paint a realistic and somewhat disheartening picture of human nature. Nevertheless, being aware of their influence as songwriters, Charlotte and Martijn are careful not to glorify negativity and they search for the silver lining in everything - something for which the moon has proven to be an excellent metaphor (which Charlotte talks about here). The album opens up with Hands of Gold, a duet between Charlotte and Alissa White-Gluz of Arch Enemy - the contrast between their voices is striking, and it works just as well as it did in The Tragedy of the Commons. Following it is The Glory and the Scum, which manages to showcase not only Charlotte's abilities as a singer, but also Timo and Merel's as guitarists. After a powerful track like that, it's time for the catchy Suckerpunch and The Hurricane to give us a breather with a simpler, but no less pleasant concept. Both seem to blend naturally into each other, as the pace gradually slows down to a morbidly sweet ballad: Chrysalis - The Last Breath. Do not be enticed by the beauty of Charlotte's voice, however, for the dynamic Fire With Fire comes in entirely unannounced and teeming with energy. Following it, Pendulum shows no signs of slowing down either. You might get a hint of Where Is the Blood? in it as well. Next in line is Danse Macabre, a feast for the ears for those who fell in love with Delain because of their symphonic and gothic elements. As if their repertoire was not varied enough already, the band have decided to take a huge risk and cover Queen's very Scandal. The result is a surprisingly good piece which in no way struggles to overthrow the legendary original, but merely offers a fresher and equally synth-pop perspective on it. The penultimate track Turn the Lights Out, already familiar to those who have listened to their EP, has us with our heads in the sky from Charlotte's singing, with only the drums and guitars keeping our feet on the ground. Finally, The Monarch comes and gently wakes us from our trance - a fitting outro for an album which commands one's attention for each second of its songs. Moonbathers will be reased on the 26th of August. To make 2016 even more amazing, Delain are having their 10 Year Anniversary bash in Amsterdam on the 10th of December, and me and mi amore will be attending the show. As an admirer of both their art and what they present to the world as people, I cannot contain my joy from all of their amazing releases this year and I hope that the path they walk on continues to lead them up. Recommended if you like: Nemesea, Nightwish, Within Temptation. I enjoyed what you wrote about Hands of Gold - the duet song. The way you describe it sounds mesmerizing! Good job!